This lovely holiday home is quite spacious and boasts a relaxation area, a playroom for the children, and a large garden and is located in the countryside amidst lush surroundings. Unwind in the relaxation area, which features an infrared sauna and a jacuzzi. You will not have to worry about the children at all. They will be having a grand time in the playroom or the garden, where they can spend time on the playground equipment or in the sandpit. If you have taken advantage of the sauna and jacuzzi and the children are finished playing, you can light up the BBQ and enjoy a fantastic dinner! In nearby Übersee (1 km), you can visit the beach, admire Bavarian clothing in local shops, hire a boat, or go climbing outdoors. 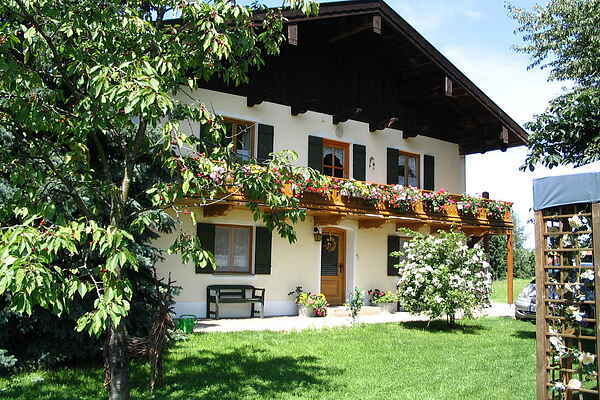 Traunstein (18.5 km) boasts wonderful local specialities, a beautiful church, bowling alley, and a billiards hall. Rosenheim (36 km) has a fantastic playground, which the children will delight in visiting. You can also admire historic Kufstein Fortress here as well.